Speech Disorders Review: Interventions for Speech Sound Disorders in Children is recommended for speech pathologists who works with pre-school and school-age children that have speech sound disorders. Title: Interventions for Speech Sound Disorders in Children Authors: A. Lyn Williams, Sharynne McLeod, and Rebecca J. McCauley. Direct Speech Production Interventions examines popular phonological approaches such as Minimal Pairs and Multiple Oppositions interventions. Speech Intervention in Broader Contexts is the largest section and examines 12 different intervention approaches. Some of the approaches, such as PROMPT and PACT intervention I was familiar with, but others were completely new to me. Intervention for Achieving Speech Movements introduces four intervention approaches that focus on young children being able to produce movements to achieve speech sounds. In short, the book examines 23 different phonological and articulatory intervention approaches. All of the approaches focus on speech sound disorders in young children - between the ages of 2-7 years, mostly. 23 different approaches I here you ask! Yes, there are that many speech language intervention approaches apparently. And that's only the intervention approaches that had sufficient research and efficacy to make the cut. The primary purpose of the book is to describe and analyze a variety of different speech disorder intervention approaches. 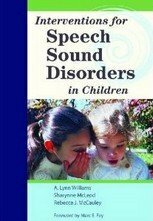 The authors of the book invited a range of leading speech pathologists/researchers to write chapters about the therapy techniques they have developed over the years. A key bonus of the book is that it features a DVD, where many, but not all, of the intervention approaches are presented. I might add that the quality of the videos do vary greatly. The videos compiled by the authors and their staff are professionally produced, and enhance the reader's understanding of the intervention techniques used. However, some of the videos are quite amateurish. The handful of poorly produced video demonstrations tend to mar the overall quality of the DVD. Some of the presenters clearly would have benefited from learning their lines before shooting the film, so they wouldn't have to read from a chart off to the side. It doesn't make for good viewing. It's similar to the effect of a lecturer reading interminably from their notes and not engaging with their audience. It also helps to plant the camera on a tripod so there is no camera shaking. But apart from these small gripes the DVD is certainly worth watching.